The unusual glass-walled revolving house shown on these pages was designed by architect Richard Foster for his own family on a six-acre site in rural Connecticut. Rejecting many more conventional schemes, the architect arrived at the final design as the ultimate response to the site’s breathtaking, near-perfect view of the surrounding countryside. For fullest advantage of the view farmland hills and a distant lake to the west, a meadow and nearby pond to the east, and a pine forest to the north the architect enclosed his circular house in glass, set it on a pedestal, and made it rotate for changing landscape, sun and mood. The key to turning a special shape into a workable house was the plan, and the key to a successful plan was provision of plenty of space, good circulation, and many special built-ins. The house is 72 feet wide, and pivots on the central staircase and hall for efficient circulation. A wide opening from living room to hall increases spaciousness, and, most importantly, pro-vides immediate orientation when the house revolves. Service rooms are grouped at narrow ends of segments to leave the periphery mostly glass. 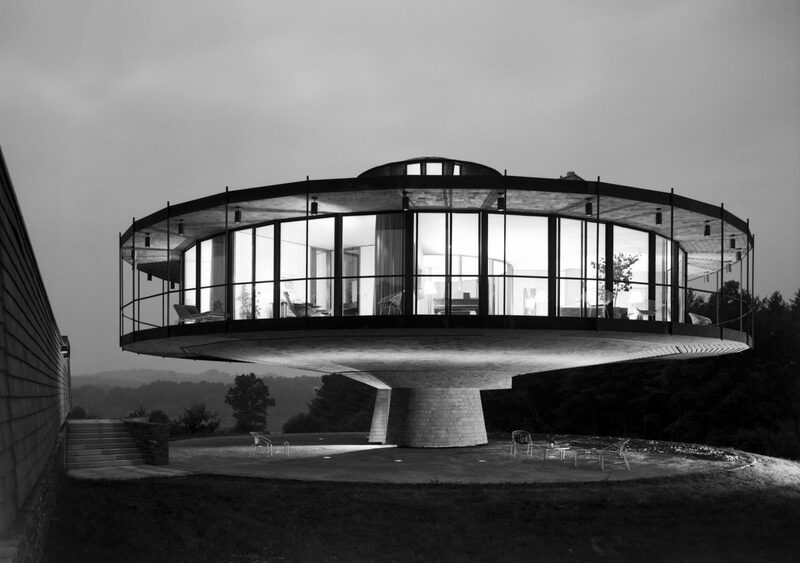 The circular house is anchored to its site by a concrete pedestal which contains entry, staircase and various utilities, and sup- ports a 14-foot-wide ball-bearing ring which in turn carries the entire superstructure. A control panel regulates motion which varies to five feet per minute and is barely perceptible. The house is very special, but it is also a year-round, every-day house designed for an active family. The architect’s solution successfully achieves complex organization for living while preserving the unity and symmetry of a self-contained formal shape. Natural-finished materials are unexpectedly appropriate to the circular house: beautifully-weathering pre-rusted steel; cedar shingle cladding for curved soffits; glazed, hexagonal-shaped tiles for unusual floor shapes. Spaces within and around the house received as much attention as the view from it. The approach—through a walled motor court, beneath the great tree-like superstructure to the pedestal entry—offers a varied spatial sequence while gradually revealing the breathtaking view. Architect: Richard Foster; engineers: Zoldos and Meagher (structural); Meyer, Strong & Jones (mechanical); landscape and interiors: Richard Foster; contractor: William Mewing.